Polaroid seem to be doing whatever they can to survive in an ever changing tech world. They have been quick to embrace mobile technologies and are about to open photo branches around the US where you can print your photos direct from your phone. Now, the optics company want to make Nexus 10 and Nexus 7 competitors with their new M7 and M10 tablets. The two tablets are the first from the company and come at a very affordable price. Both new tablets are running Android 4.1 Jelly Bean, although this is skinned to a trim of its bare bones. Polaroid have created a funky and simple UI to sit on top of Android. CES 2013 has unsurprisingly been filled with every single idea off the block for a Windows tablet. With Microsoft OEM partners trying to develop the ultimate way to use a tablet and keyboard hybrid. We are happy to see an Android tablet, even if it is skinned. Polaroid aren’t looking to create a great camera or photo experience with these two tablets and we are glad, because if there is one thing we cannot bare, its people taking vain photos of themselves with their tablet. Both devices are equip with 1280 x 800-pixel IPS displays, 2MP front facing cameras and microSD slots. The smaller version, the M7, has a dual-core processor with 8GB’s of internal storage. 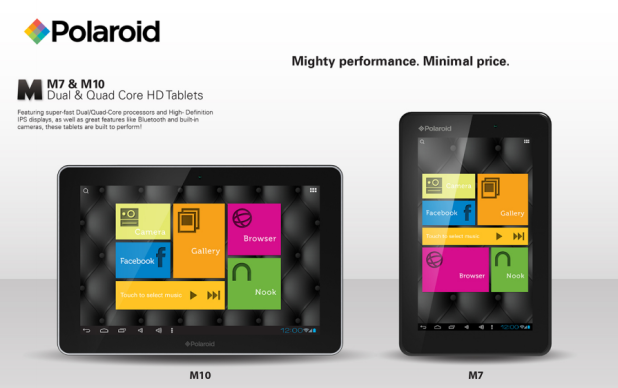 The bigger ten inch version, M10, has a quad-core processor with 16GB’s of storage. Just to smack some more competition in Google’s face, they have starting prices that almost match the Nexus prices. The M7 starts at $129 and the M10 for $229. The M10 definitely defeats the Nexus 10 in terms of price, but we’ll have to wait to see if they are any good. Both devices will be ready to go on sale this spring. This is yet another weird but wonderful step as Polaroid move from being an optics company that specialises in film cameras.